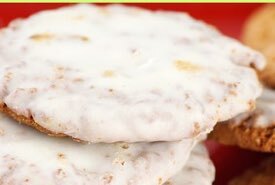 Mom's old fashioned lemon cookie recipe makes delicious homemade cookies flavored with the lemon's all-natural juice and grated zest. 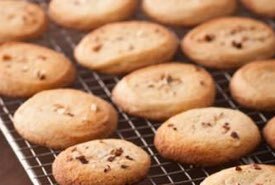 They are great to have on hand in the cookie jar for the family to dip into whenever they want a special homemade treat, so make plenty! Two cups sugar, 1 cup (heaping) butter, 2 eggs (well-beaten), rind (grated) and juice of 1 lemon, 1 cup sweet milk, 3 cups flour, 2 teaspoons (rounded) baking powder. Cream together in a large bowl sugar and butter. Add the eggs well beaten. Add the grated rind and juice of one lemon, or use any other flavoring preferred. Gradually pour in the sweet milk and flour which has been sifted 3 times with the baking powder. Roll out quite thin and use a small cutter. Bake in rather quick oven, and let the cookies get cold and hard before putting away. These will keep good and remain crisp almost indefinitely, and therefore are good to make up to have on hand in the cookie jar. Four cups of sifted flour, or enough for a stiff dough, one teacupful of butter, two cups of sugar, the juice of one lemon and the grated peel from the outside, three eggs whipped very light. Beat thoroughly each ingredient, adding, after all is in, a half teaspoonful of soda dissolved in a tablespoonful of milk. Roll out as any cookies and bake a light brown. Use no other wetting such as milk. 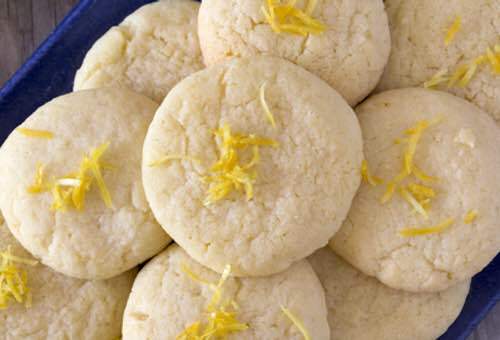 This old fashioned lemon cookie recipe makes good lemony tasting drop cookies, or biscuits as the English prefer to call them. Ingredients: 1-1/4 lb of flour, 3/4 lb of loaf sugar, 6 oz of fresh butter, 4 eggs, 1 oz of lemon peel, 2 dessert spoonfuls of lemon juice. Mode: Rub the flour into the butter; stir in the pounded sugar and very finely minced lemon peel, and when these ingredients are thoroughly mixed, add the eggs, which should be previously well whisked, and the lemon juice. Beat the mixture well for a minute or two, then drop it from a spoon on to a buttered tin, about 2 inches apart, as the cakes will spread when they get warm; place the tin in the oven, and bake the cakes of a pale brown from 15 to 20 minutes. Time: 15 to 20 minutes. Seasonable at any time.